Your proficiency with the MF5, especially in burst or fully-automatic firing modes, is greatly dependent on your ability to master the necessary skills described below. contrary to popular belief, the muzzle of the MPS in fully-automatic fire does not rise. The weapon simply pushes straight back into the shooters shoulder. However, the vertical and horizontal rotation of the shooters body causes the muzzle of the weapon to move upward and outward away from the initial point of aim. While the first round may strike the intended aiming point, the recoil from each subsequent round pushes the shooters shoulder back further and further and the sights farther away from the center of the target. For example. A right handed firer's rounds will impact in a diagonal line from the initial point of aim in the direction of 2 o'clock (high and right). A left handed shooters rounds will climb high and to the left towards the 10 o'clock position. It is impossible to prevent this rearward push that starts this rotation, regardless of how large or strong the firer may be. It is a simple law of physics.that cannot be overcome by Bimple brute strength. This rearward push can only be countered through the use of the proper techniques, as described below. 1. A stable position that allows the firer to resist (counter) the rearward push of the weapon caused by recoil. 2. Concentration on sight alignment and sight picture. 3. Conscious redirection of the weapon by making fine adjustments with the body. . The stance should be a natural position to hold, and a position that is realistic to the tactics usually employed with a submachine gun- Range training and operational use of the weapon should be the same, so the 6hooter should train what he or Bhe will do on the day of an actual operation. Ultimately there will be occasions when forward movement by the firer will be required, either to close in on a suspect or during clearing rooms in a building. During thiB movement the necessity to open fire may become necessary. The stance should be one that allows the firer to shoot while still on the move and without having to stop. Therefore, the stance should be logical and a6 close to a natural position as possible to give the firer the best possible option when confronted in a deadly situation. It should also be a position that he or she will naturally assume instinctually. The correct stance is also described as a "boxers stance", denoting it's aggressive, stable appearance when properly assumed. To properly assume this position follow the steps listed below, starting at the feet. 1. Position feet - Face square on to the target, feet shoulder width apart. Drop the strongside foot back about 6 inches (right foot for a right hand shooter, left foot for a left hand shooter). 2. Flex the knees - Slightly bend your knees to allow flexibility in the body (like shock absorbers). Your weight should be evenly distributed on both feet. 3. Position the head and body - Your hips and shoulders should be square to the front with the head upright. Tilting the head will result in a loss of balance, especially in a darkened environment. 6. Position non-firing hand - The non-firing hand should grasp the forearm/foregrip in a comfortable position, keeping all parts of the hand well clear of the muzzle. The non-firing hand is the control hand used to make the minor adjustments in the direction of the weapon prior to and during firing. Therefore, only a moderate amount of pressure is exerted on the forearm/ foregrip of the weapon with the non-firing hand. Just enough so that the weapon never slips out of the palm during movement or firing. 7. Tuck in elbowj - Pull the elbows in close to the body to lock in the weapon and to prevent them from getting knocked about during movement. Concentration - Concentrate on the sights during firing, constantly striving to maintain correct sight alignment and sight picture as the weapon fires. Focus your concentration on the front sight. Your secondary vision (often referred to as peripheral vision) will allow you to "see" the rear sight and target without focusing directly on them. As the sights move out of alignment and drift away from the initial aiming point, reacquire them and force them back into the center of the target using fine adjustments of the arms and body. Work to keep them there until the burst is complete. Conscious Redirection - Immediately resist the tendency of the weapon to push your shoulder back during recoil. This movement becomes very pronounced by the time the second or third shot is fired. Consciously redirect the sights to the initial aiming point on the target through minor adjustments with the non-firing hand and body. If you do not act to consciously redirect the weapon at the aiming point the weapon will unconsciously direct you away from the aiming point. Control the weapon. Do not let the weapon control you! 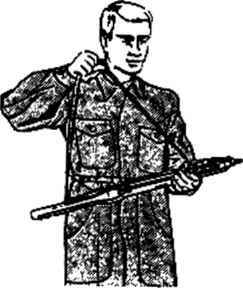 As a drill using a "Clear" weapon, have someone slap the muzzle of the weapon back into your shoulder with their palm. When the position is correct, the muzzle of the weapon should move very little to the rear (less than 1/2 inch) and should immediately spring back into it's original position. The body should appear almost rigid to the observer. As with any weapon, good steady-building trigger control is also important to good machine gun shooting. Why does a submachine gun rise during firing?